Like most travellers, I have a mental bucket list that I am constantly updating. As a travel blogger, I have been very fortunate to regularly check off items from that list. But the #1 thing on my bucket list, remained, chewing away at me….until recently. 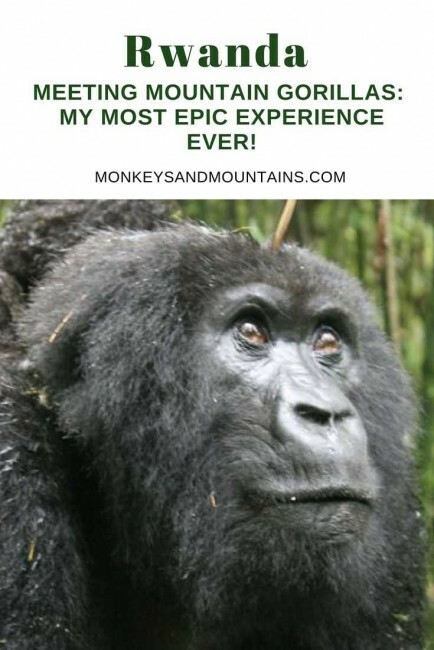 It will probably come as no surprise to those of you that know me and even those of you who don’t – my blog is named Monkeys and Mountains after all, that the #1 thing on my bucket list was to observe Mountain Gorillas in the wild. I had studied Western Lowland Gorillas during my Bachelor of Science in Primatology. I went on to work in environmental education at a zoo and designed and taught primate environmental enrichment programs. But still, I had never seen a gorilla in the wild. My dream came true on my ultimate Rwanda adventure. An EPIC trip that will stay forever in my mind. Bleep, bleep, bleep. That was the alarming sound I woke up to at 5:23 am. Normally I would have turned it off, and then hidden under the covers, but not today. Today I pulled the covers aside and leaped out of bed, my feet hitting the cold floor of Amahoro Guest House in Musanze, Rwanda. Today was the day I would be seeing Mountain Gorillas in the wild! Flash forward 30 minutes later and Omar my friendly guide has picked me up and I’m now in a group with six other gorilla enthusiasts. Our trek to the low stone wall marking Volcanoes National Park has begun. Here's How You Too Can See Mountain Gorillas. 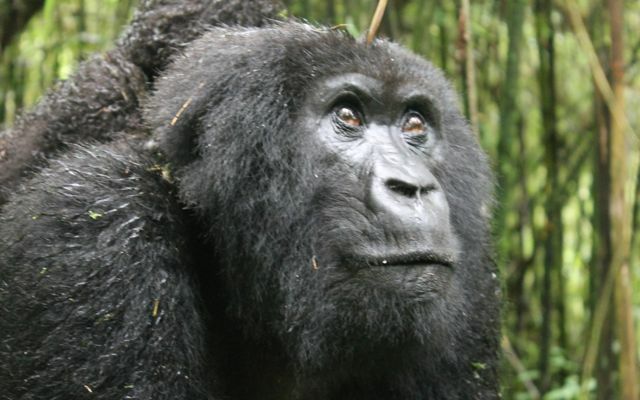 One of the three silverbacks that comprise the Sabyinyo troop. Our guide repeatedly spoke softly into his 2-way radio, speaking in his native tongue of Kinyarwandan. I didn’t understand him, but I did notice the worried look in his eyes as he exchanged glances with our other guide before brightly announcing that the trackers couldn’t find the gorillas but not to worry. What? No gorillas? My pulse quickened. Don’t worry, he assured us, the gorillas are moving fast in search of bamboo shoots. He repeatedly assured us that the trackers would find the gorillas, but even he sounded less and less convinced as we waited just outside the park border to Volcanoes National Park. Half an hour later we were still waiting. Finally, he got the call we had been impatiently waiting for – the trackers had located the gorillas, but we would need to hurry to catch up with them. Drunk silverback playing with his belly button. But first, he had to warn us of one other thing….bamboo shoots make the gorillas drunk! 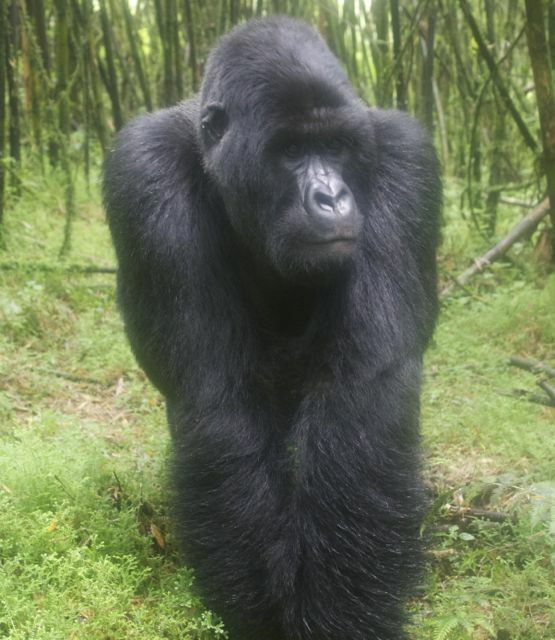 And there were not one, not two, but three silverbacks, including Guhonda, the largest and oldest silverback in the entire Volcanoes National Park! We had to be prepared for….drunk gorillas! It turns out that a drunk gorilla might parade around a bit more, beating their chests, showing off how strong they are, intimidating other males, or (gulp)…us. Doesn’t really sound all that different from drunk men does it? We began to hike the steep muddy trail. I was full of adrenalin and could have raced up the hill, but we could only go as fast as the slowest member of the group. In other words not nearly as fast as I would have liked given the fact that I knew Mountain gorillas were waiting for us. 90 minutes later we reached the trackers. We dropped off our backpacks and took out our cameras as we followed the trackers to the gorillas. I smelled them before I saw them. It wasn’t a bad smell, but a distinctive gorilla smell. Two of the Sabyinyo troop’s silverbacks. A branch snapped, I looked up and saw the behind of a huge male gorilla – one of the silverbacks who was obviously suffering from stomach problems as evidenced by his backside. Then he was gone, disappearing into the bush, despite his massive size! We moved quickly, deeper into the bamboo forest. Then out of nowhere, I saw him….Guhonda, the largest and oldest silverback! I quickly started snapping pictures, but he was moving quicker than we were and just as quickly he was gone too. The next 20 minutes are so consisted of playing hide and seek with the gorillas. One second you would see them, the next second they had vanished! Kampanga, the mother mountain gorilla who melted my heart. Then IT happened. By IT I’m referring to one of the most magical moments of my entire life! A female gorilla (who I later found out is named Kampanga) stopped long enough to look up and acknowledge us before going back to searching for bamboo shoots, but she moved slowly carefully…Perhaps it’s because Kampanga had a baby on her back! YES, A GORILLA BABY! Kampanga and her adorable son or daughter (the trackers didn’t know yet). And not just any baby, but a baby who seemed to know how cute he was! He played it up for us as we snapped photo after photo. We stared. He stared back with his massive curiosity filled brown eyes. Kampanga decided to move on, coming closer and closer to us. I was in her way and she gingerly took her hand and brushed my leg, as if to say Excuse me. OMG, I had just been touched by a mountain gorilla! And a very polite one at that! It took every ounce of willpower not to reach out and touch the baby on her back who was literally just inches from me. I was so close that had I extended my arm half way I would have touched him. He’s a star and he knows it! After passing, she let out a low grunt, which I interpreted as Thank you in gorilla language. She proceeded to climb up a tree, her baby’s expression changing from one of curiosity to that of fear, his eyes growing even bigger as his clutch around her fur tightened….Then they were gone. Words cannot begin to express how I felt….elated….dizzy with excitment…thankful….beyond grateful for the opportunity….Words are simply not enough. Even now as i write this, several weeks later, my breath has quickened. It was truly one of the most memorable moments of my entire life! Our time with the gorillas had not yet come to an end yet though. We moved on and caught a glimpse through the bamboo forest of Big Ben. Big Ben is famous in his own right, for despite being a juvenile gorilla. He is bald! The Gorilla Doctors have examined him and he is perfectly healthy…but bald. Poor guy! Wonder if that impacts his chances with the ladies? We passed Karema, another female who is easily identifiable by her missing fingers, caught in a snare. Snares are not common in Rwanda any more due to some impressive initiatives by the Rwandan government (to be discussed more in an upcoming post), but that wasn’t always the case. Guhonda taking it easy, perhaps his bamboo buzz had kicked in? Next, we stumbled upon Guhonda again, the park’s largest silverback. He was settled down, perhaps his bamboo shoot buzz kicking in. PFIFFFFF PFIGGGGHHH. Yes, that is the sound of a silverback having gas! Something that gorillas have a lot of. Given the fact that Mountain gorillas are predominantly herbivores, this shouldn’t come as a surprise, but still, I found it entertaining. Me posing with Guhonda (well kinda)….he did have bad gas after all! As a FYI gorilla gas doesn’t stink when you’re standing 3 meters away. All too soon, our hour was up. It was time to go. To leave the gorillas in peace. To be gorillas again without a group of tourists snapping pictures, oohhing and ahhing…. or poking fun at their flatulence. I was the last one to leave and did so only at the urging of our guide. I waved goodbye to Guhonda and mouthed a silent Thank you and until next time…. It’s not cheap. A one hour permit will set you back $750 – but it’s worth every penny! Book as far in advance as possible. There is a maximum of 80 people a day and spots fill up quickly, the exception being in May, when I went, during the rainy season. Once you arrive at Volcanoes National Park, your guide will ask you how far you want to hike and then try to find a gorilla troop to match your abilities. Porters are also available to help you and carry your backpack. Photography tip: Flash is not allowed. Set your ISO settings at 1600 or 3200 so that the gorilla’s faces show up. I got this excellent tip from a guy on my tour who got it from a professional photographer on his previous tour. You can see more primates (including chimps) in Nyungwe National Park in the south part of Rwanda. I highly recommend it. This experience does sound EPIC! I have only had a couple of monkey interactions, the last being at the Monkey Temple in Thailand. They were trying to climb my legs to get bananas! Wow, this looks absolutely incredible. 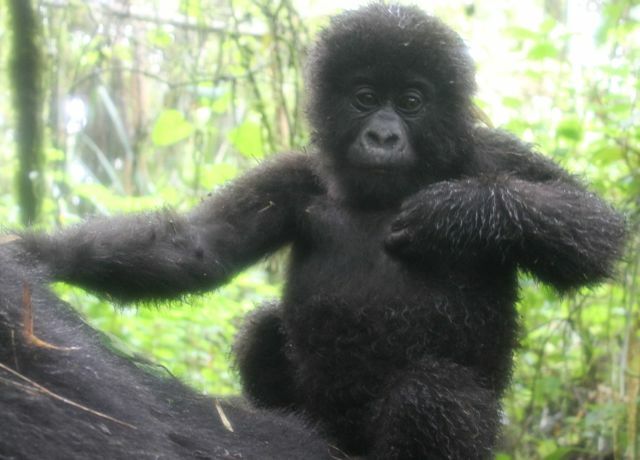 I would love to see gorillas in the wild, especially if there was a chance to see a little baby like this! What an incredible experience! So amazing that you not only got to see a baby, but that the mom also touched you. I'm sure you'll remember that vividly for a long time to come. What an awesome experience! I can't even imagine how exciting it must have been to see gorillas in the wild. I love the pictures of the baby and mother. I'll try to remember that photography tip! @Katherine - I was so grateful for the photography tip so that I could enjoy the gorillas and not be fiddling with my camera settings. Wow! I'm super jealous. I'd absolutely love to do this. Gorillas are such fascinating animals, and it would be amazing to see them up close in the wild. So cool. Hi Laurel, Wow! That's an epic experience indeed. I'm so thrilled for you. It must amazing seeing them in person. I love your encounter with Kampanga and her baby. They were almost human-like. I can't believe how expensive the permit is. As you said, I'm sure it's pretty worth it. I hope to experience it someday. Thanks @Marisol. My encounter with Kampanga and her baby was definitely the highlight. I was shocked at how expensive the permit was as well. It used to be $500, but the government increased the price a while ago. AMAZING! Great photos! That would be an incredible experience -- So jealous! Would love to experience that! @Deb - Can't recommend it enough! What a fantastic experience Laurel - and one that will be hard to follow. One hour must have slipped by so fast and just felt like seconds. Do the high prices for guiding you to the gorillas go towards protection of the gorillas? You're photos are great and that baby is a real cutie. Sounds like my kind of gorilla. So pleased you realized this lofty goal on your bucket list. The enthusiasm is obvious in you post and the photographs are excellent. Thanks for sharing. That's a really nice post! It's definitely also on my bucket list to visit the gorillas in Rwanda. Like you said it is quit expensive but I can believe it's worth every penny. I personally really like Orangutans. I saw a few wild ones in Malaysia (borneo) and this encounter was really amazing. One of the things on my to do list is volunteer in an Orangutan shelter in Indonesia.... Nice blog! I will keep following it! @Bastiaan - Thank you. I hesitated because of the cost, but definitely worth every penny. Three people on my tour were there for the third day in a row they liked it so much. Would love to see orangutans, that must have been amazing as well. Volunteering with them is on my list as well, think it would be an incredible experience. Thanks for your kind words and for stopping by. Gorgeous animals. Seeing gorillas in the wild in Rwanda and/or Uganda is high in my list. Wow! Just wow! Would have blown my mind seeing them. I remember seeing monkeys and sloths for the first time in the wild. Incredible experience I'll never forget. @Nicole - Love your reaction! I must have said "Wow" a hundred times when I saw them. @Nat - My favorite travel experience to date and agreed an excellent reminder. Pretty cool. I am surprised you got close enough for one to brush by you. Wild that they get drunk on bamboo. I had no idea there were different types of gorillas. I will have to pay more attention next time I go to a zoo and see them. Seems like something totally up your alley. @Andrew - Me too. Technically you are supposed to stay 5 meters away, but they let us get closer since the bamboo forest was so dense. I was surprised to hear about the bamboo as well. I visited golden monkeys the next day and they were getting drunk from the bamboo shoots as well. In a zoo you'll most likely see Western Lowland Gorillas. Mountain gorillas don't do well in captivity. I am really surprised that they aren't more aggressive. I've only seen them in zoos. And they always scare me. So I cannot imagine what they would be like in the wild. I'm not sure I can do it. But I'm glad you did, as "monkeys" are so important to you. Looks like a lot of fun for someone who isn't afraid. Amazing - can't believe you got so close! @Andrea - Me either. I couldn't believe it when the female touched me and how gentle she was. This is incredible. 'Epic' seems like a bit of an understatement. Would love to do something like this one day - sounds unreal. @Turtle - Cannot recommend it enough! WOW - what a fantastic experience! @Cam - The best travel experience I've had so far. It really was incredible! What a cool experience! I felt like I was right there with you. @Christy - Definitely a dream come true for me. Glad I could bring you there if only by reading. Incredible, what a truly epic adventure! I kinda love that gorillas get drunk, though might not start distilling bamboo anytime soon. Great pics and the narrative really puts me there. I'm totally jealous but thanks for sharing your adventure. Laurel, this sounds awesome! I can't imagine being this close to gorillas in the wild. And the drunk thing? Hilarious! I'm so glad you got to do something like this you've been dreaming about! @Ali - I know, who knew that gorillas also liked to get drunk. It was truly a trip of a lifetime and I am so grateful for the opportunity. Awesome photos! I've been looking into doing this either in Uganda or Rwanda but this post might have swayed it for me. @Jon - I can only comment on Rwanda, but I LOVED it and they do an exceptional job at conservation. WOW, what a fantastic experience this must have been!!! Very well written, and stunning photos!! I almost felt like I was there with you! :) Awwww, and that baby gorilla is soooooo cute!!! Seeing gorillas in the wild is one of my biggest dreams too, it is high up on my bucket list. Some day we will go there too! @Maria - I can't recommend it enough! One of the highlights of my life - not just of traveling! This is all amazing - I've looked through a couple of your Rwanda posts and it looks like an epic trip. I'm off to Rwanda in February, we got our gorilla permits confirmed a week or two ago, but haven't yet looked at much else to do while we're there. I can't wait to get up to see the gorillas though! 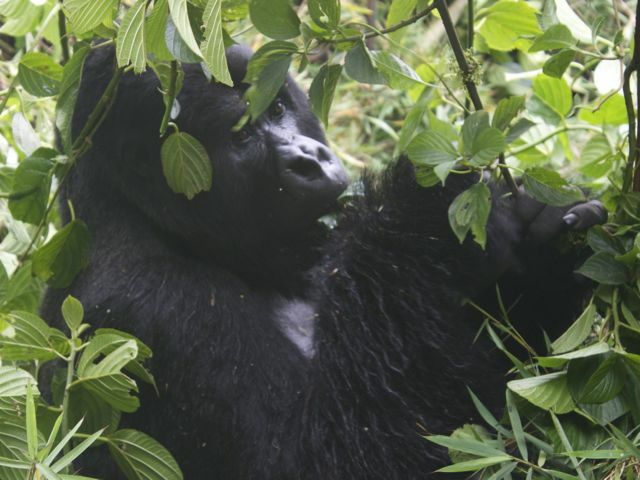 @Andrew - You will love observing the gorillas - truly an incredible experience. Also highly recommend Nyungwe National Park. It's not very popular but home to incredible wildlife and very beautiful!